Over the years Harbour Heights Hotel with its magnificent Modernist design, great service and stunning views has rightly earned many superlatives & recommendations from an impressive contingent of illustrious visitors. Its location on a sunny, maritime-pine slope with uninterrupted vistas over Poole Harbour to Brownsea Island, and from Shell Bay, around islets and the harbour’s western shoreline to Arne, with the Purbecks as backdrop, is a perspective which becomes indelible in the memories of those fortunate to have visited and stayed there ! Back during early Edwardian times, in a new century, this part of South Poole (referred to as Parkstone-on-Sea) when Canford Cliffs village and Sandbanks were being developed on land released by Lord Wimborne’s estate, a Gentleman’s Seaside Villa named East Looe was built on this prime site stretching down to the harbour shore. [According to local author Iris Morris (2001), during 1901 the site was conveyed to Mr. R.G. Peck for £1,875.00]. Reached from Canford Cliffs village by the Banks Road (this section later renamed as Haven Road), the locality also benefited from the modern promenade with its dolphin lampposts & the upgrading of formerly tidal Shore Rd. With an elegance equating to the Thames Embankment these lampposts were marked ‘Lemon & Elford (1895)’. 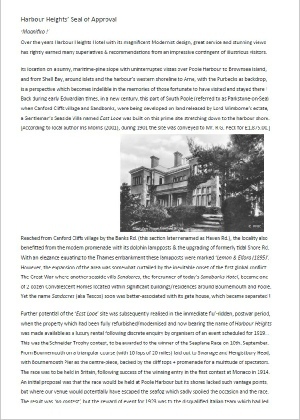 However, the expansion of the area was somewhat curtailed by the inevitable onset of the first global conflict: The Great War where another seaside villa Sandacres, the forerunner of today’s Sandbanks Hotel, became one of two dozen Convalescent Homes located within significant buildings/residences around Bournemouth and Poole. 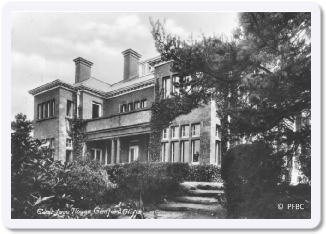 Yet the name Sandacres (a.k.a Tescos) soon was better-associated with its gate house, which became separated! This was the Schneider Trophy contest, to be awarded to the winner of the Seaplane Race on 10th September. From Bournemouth on a triangular course (with 10 laps of 20 miles) laid out to Swanage and Hengistbury Head, with Bournemouth Pier as the centre-piece, backed by the clifftops + promenade for a multitude of spectators. The race was to be held in Britain, following success of the winning entry in the first contest at Monaco in 1914. An initial proposal was that the race would be held at Poole Harbour but its shores lacked such vantage points, but where our venue would potentially have escaped the sea fog which sadly spoiled the occasion and the race. The result was ‘no contest’, but the reward of event for 1923 was to the disqualified Italian team which had led. However, Harbour Heights had received its first set of VIP guests by way of the organisers: the Race Committee whose senior figures H.E. Perrin, S.E. Saunders, Major Mayo, Alec Ogilvie & Frank McClean stayed there, alongside the Italian team members including Savoia’s Srs. R. Confleti (designer) and Lawrence Santani (constructor), with their star pilot Guido Janello bringing his S.13 from Cowes to the Lilliput shore for practice in the Harbour. 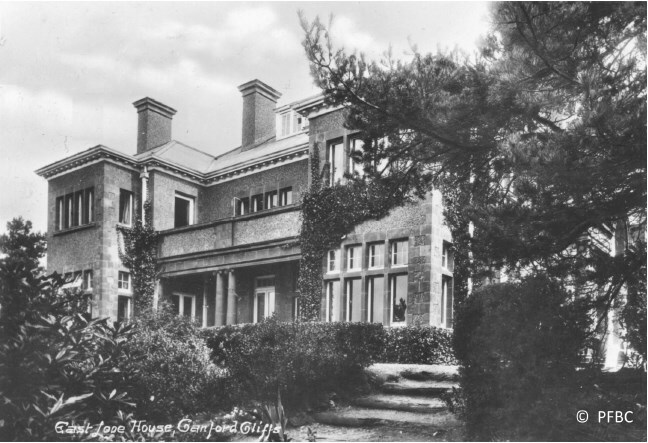 “Between Haven Road and Chaddesley Glen, on the hillside overlooking Poole Harbour, is a brave and enterprising group of ‘early modern buildings’, the Harbour Heights estate of 1935-36 by A.J. Seal & Partners of Bournemouth (Jasper Selway did much of the designing). It consists of the Harbour Heights Hotel, two blocks of flats The Haven and Conning Tower, and two rows of single storey, flat-roofed terrace houses (Haven Close)… These buildings are admirably sited, with prominent glazed staircase curves (derived from Mendelsohn); but the detailing everywhere degenerates into what Betjamen calls the Tel-Aviv style! 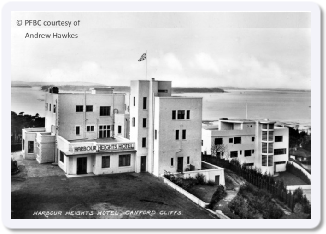 With the intervention of another world war, and the requisitioning of Harbour Heights and Harbour Court in WW2 to provide an RAF Officers’ Mess + VIP Passengers’ overnight accommodation, with the Officers’ Quarters next door, a new era of hotel visitors, BOAC Flying Boat passengers & seaside holidaymakers eventually followed in peacetime ! 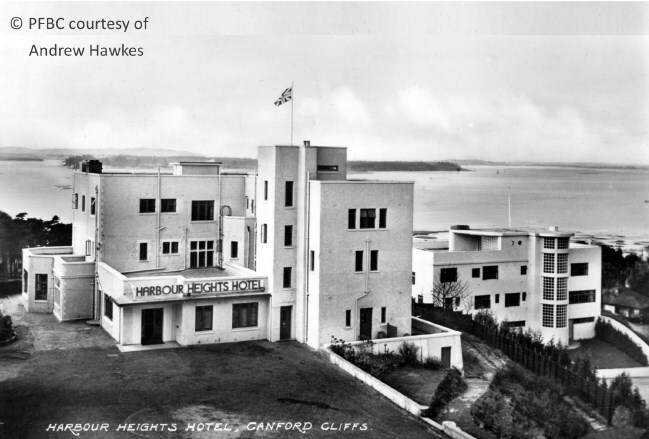 The popularity of Harbour Heights Hotel encouraged subsequent owners to expand the number of floors and rooms; garnish more restaurants and extra facilities; and significant expansion of opportunities under the present Maestros.